A Review of the 50th Venice Biennale. Being once a central city between the East and the West Venice itself has a very interesting history viewed from the multicultural view. Also Venice is known for black slavery through centuries. In a humorous way Wilson shows the history of the black people in paintings and kitsch, always being marginalized - even in the paintings they are situated in the margin. So he is reinterpreting and deconstructing the Western history by showing us, how the black people were the hands and supporters of the white man (the thinker) in some very kitschy black-and-white 'sculptures', the black man carries in his hands the hands cut off from the white man. 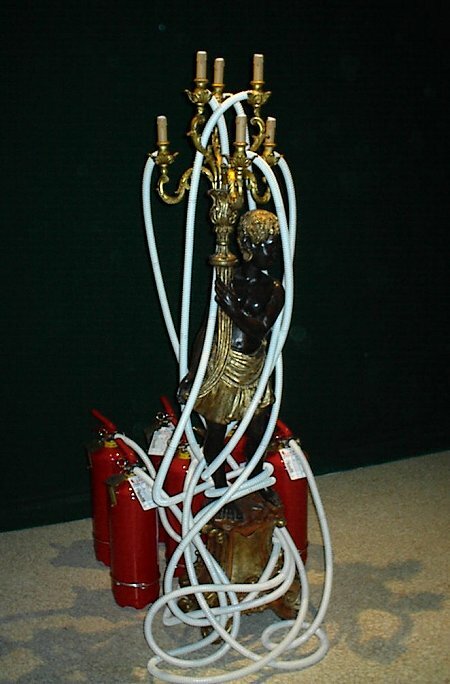 Very symbolically he deconstructs some lamps (cultures) where the holder of many lights is a black person. The lights here are not lightening any more, but are put out by several fire-extinguishers. To illustrate the black-white-constellation in art and culture cuts from Verdi's opera Othello, the Moor of Venice from 1887 were looped backwards and forwards showing the famous scene where Othello strangles Desdemona out of jealousy. 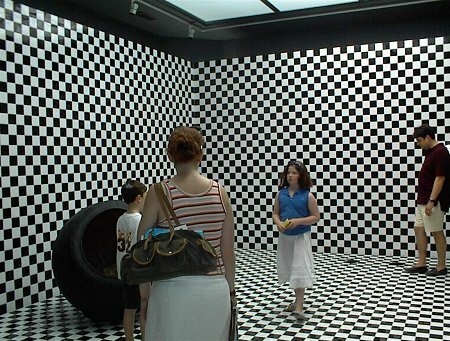 In the installation built by black-and white tiles like a bath-room where the audience may walk inside, a little body-sized round 'cave' was also situated with a lot of objects and media used daily in an everyday situation by most young people in the industrialised countries, the mobile, television, walkman, book, - perhaps objects to re-write the history dominated by the Western male culture. But the contrast between the dark 'soft' 'cave' and the large open 'cool' installation was of course significant and symbolic. The USA chose for the representation in Venice a black artist - representing a race and a culture being suppressed by the white race and the Western culture - for centuries. A very sympathetic selection concerning the political global situation today. 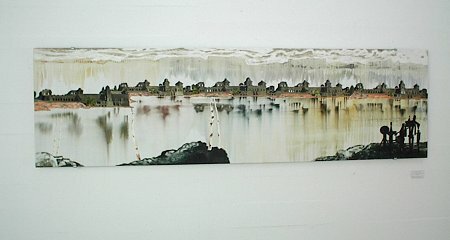 The black-white colour opposites are the concept everywhere and are used in an 'artistically' conscious way. It is logically to think that Wilson's intention also is to show that in art the colours have no levels and discriminations, and because of this art is still able to be the model and a counter image in relation to reality. The artist Chris Ofili has been awarded with the most prestigious prize in the visual world, the Turner Prize. The five 'paintings' are here a sort of symbolic representation of a black nationalist philosopher Marcus Garvey who in 1920 'created' the African flag consisting of three colours red, green and black. Red for 'the colour of blood which men must shed for their redemption and liberty', black for 'the colour of the noble and distinguised race to which we belong', green for 'the luxuriant vegetation of our Motherland'. The paintings are here in these three colours and always with the figuration of a loving couple. They contribute to the debate about the liberation of the black race, a vision with reference to a paradise, 'the Utopian station' where all meet in love and liberation. Like the American pavilion the English is debating the race-problematic between black and white very explicitly. The viewer is taken into a world of recognizable elements, in scenarios where multiple meanings overlap." 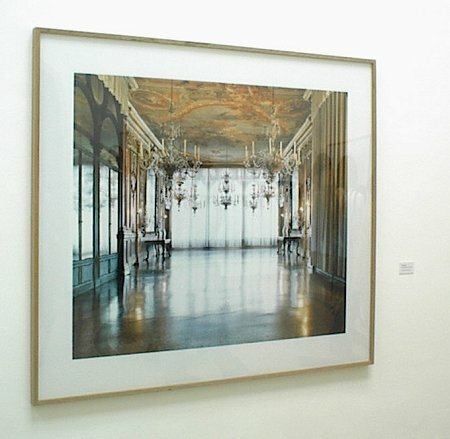 Here we find the photographer Candida Höfer together with Martin Kippenberger. She is showing her well-known photos of the interiors from official buildings from all over the western world, mostly. From offices and archives, from museums and parliaments, from subways and stations, from old historical buildings to the newest avant-garde architecture, from the more humble back-stage-places to the most central official palaces and castles. The official anonymous places and buildings where you never feel really at home. and please note that in 1995 she had an exhibition at Galleri Tommy Lund, Odense and in 2000 at Museum of Photography, Det Kgl. Bibliotek, Copenhagen, Denmark. In 1996 she made a series of photographs from Copenhagen). The French artist Jean-Marc Bustamante 's exhibition of photos, an installation and paintings are called the Pavilion of Amazons. 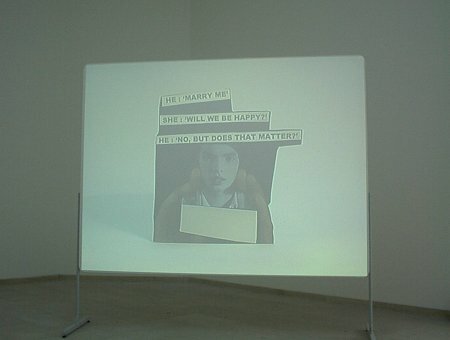 Jean-Marc Bustamante is here connecting the situations of women and artists and showing their often marginalized situation and 'landscapes'. For a woman to be able to make images, she must first extricate herself from this position of being an image. What we are talking about here is perhaps a symbolic transformation of huge dimension in the western culture, which art explores more quickly and more strongly than other areas of social life. What interest me is how Silvie, Valérie and other artists are working at this transformation." The interesting fact here is that it is a male that proclaims the feministic issues, being of course absolutely relevant also in the Venice Biennale. Counting the contributions in the Biennale in respect of equal gender representation is of course very difficult, because of the foreign names from the Arabian and Eastern countries. But looking at the more familiar names in the 'poster-project' in the Utopian Station, the art world is still some way from Utopia. Also among the eleven curators we only find three women. The pavilion represents an exhibition named We Are The World by five artists of different cultural origins, but all living in the Netherlands., Carlos Amorales (born in Mexico City), Alicia Framis (born in Barcelona), Meschac Gaba (born in Cotonou, Benin), Jeanne van Heeswijk (born in Holland) and Erik van Lieshout (born in Holland). "Central theme of the show for the Dutch pavilion is the issue of cultural equilibrium within the current social and political framework, in which the multicultural society, especially in the Netherlands, is questioned strongly. What always seemed to be the icon of a tolerant country, a striving for integration of its rapidly growing non-western community, turned out to lead to a deeply divided nation with frustrating and sometimes even xenophobic feelings centering around the so-called issue of a 'multicultural drama'". So two Dutch born artists together with tree immigrant artists under the title We Are The World associating solidarity and community, are debating the multicultural problems and the visions about more tolerance in the world where old borders every day are transgressed and moved. The name of the Spanish pavilion was covered by the artist as if it was under construction or being de-constructed? About one meter from the door was a huge built wall - and an empty bathroom and some tools left by the craftsmen confused the viewer. Here was no entrance, but behind the building were some Spanish policemen checking your nationality, because only Spanish citizen were allowed to enter the room - so they told you. 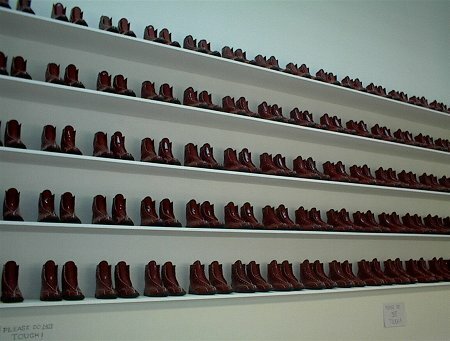 The artist Santiago Sierra (born in Spain, lives in Mexico City) here delivered one of the most radical political statements about nationalism and discrimination, of course in an ironic way in a performance-looking art form. In her sculptures the female artist Patricia Piccinini introduced us to the most disgusting, terrifying and scaring 'Utopian vision' about the future. Children playing with anatomically de-formed creatures like chimeras and children with sick and old faces, pose the ethical and political question about the genetic manipulations in the science of today. Here the viewer is confronted with our prejudices about normality. In the future we shall perhaps have to re-write and adjust this word. But where is the border, we ask. It is perhaps a nightmare-dream? The two young artists, Athanasia Kyriakakos (born in USA, lives in Athens) and the Greek architect Dimitris Rotsios have created a site-specific installation with video projections upon some 'walls'. The videos are showing people telling us about confessions and descriptions of dreams in over 200 interviews. 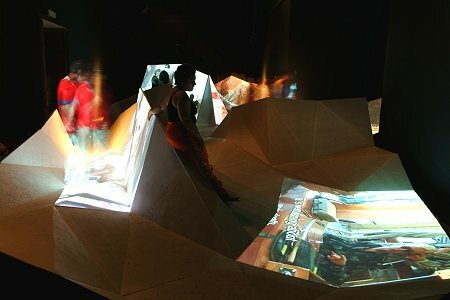 The public is invited to climb into the installation not without some danger of loosing their balance - like moving into a dream where the 'normal' parameters are unbalanced and disrupted. Referring to the Greek mythology based on dream analysis the Greek installation has followed an old Greek tradition. The title INTRON is the word of a DNA-molecule that seems to have no function (the science cannot document the function), but nevertheless it has - like a dream. From a country with old Greek mythology based on dream-analysis, we find a 'dream-installation' with a Greek title from the biological science. The question must be posed: Is this a symptom of something? The Danish/Icelandic artist Olafur Eliasson's 'treatment' of the Danish pavilion takes up a remarkable other position and difference both in relation to the other pavilions and to former Danish representation. The pavilion or the house has been transformed and de-constructed into a visionary Utopian station, or an 'island' in the middle of the traditional landscapes of houses and pavilions. Here is the most radical cross-over experiment between architecture and art in the biennale. The pavilion has been transformed into a house of many levels and expresses visions and Utopias about new ways of looking and sensing the world - and yourself (as the philosopher Thomas More did in his book Utopia from 1516). The house suggests the kaleidoscopic view, a multi-perspective way of sensing the world. The theme for the biennale is Dreams and Conflicts. The Dictatorship of the Viewer. The last part about the issues of the reception of art, the way that the viewer experiences and senses the art, is one of Olafur Eliasson's most discussed issues. With the title Dreams and Conflict it is very reasonable to associate into a Freudian-dream-terminology here, because the house here is a symbol of a person. (Staircases also have a symbolic meaning). Like in dreams you find this de-constructed or transformed house with many levels, displacements, openings and closings, and walking in the house is nearly as being Alice in Wonderland. Here you also find the earth cave built of black bricks (produced only of earth) and here is the mirror-cabinet showing you many 'egos'. Here are cylinders and kaleidoscopic constructions between the outer and the inner, between the upper and the lower levels. Surely, here are the possibilities of openness to many interpretations by the viewer - like we do with a mysterious dream. Let us take a walk around in the 'dream-house'. 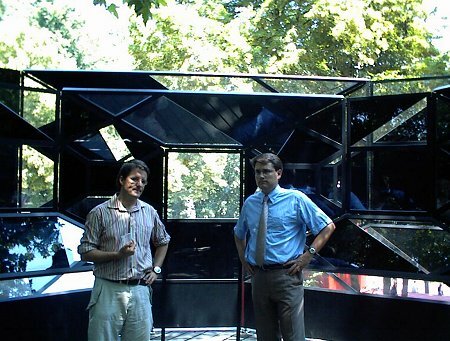 Physically the house was built in four levels, from the ground, to the space-cave, to the wooden terrace up to the black crystal-pavilion, mostly built of black glass with mirror effects. 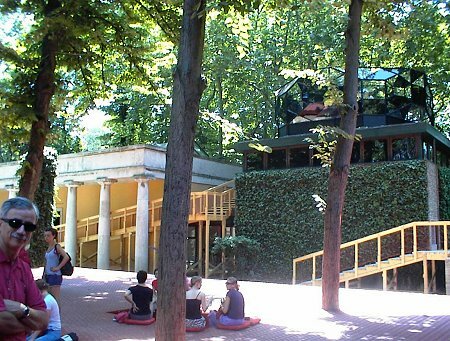 This mirror-pavilion gives possibility for views out into the Giardini-garden and for views inside into the Pavilion - and upon yourself, the viewer. 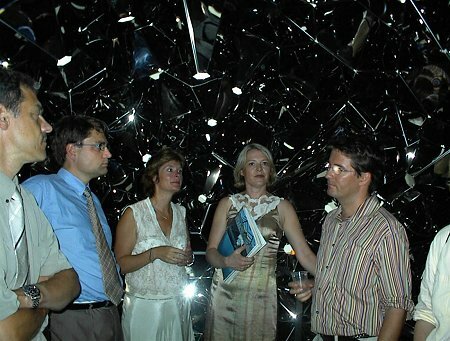 The artist named this pavilion 'The blind Pavilion', because at one point in the centre of the pavilion all the black painted mirrors meet in one point, and it is as losing your sight, being blind. We move around in several materials (steel, iron and glass, wood and earth) and in different light, (day-light and artificial light). Light and colours are 'sine qua non'. In the room with the yellow light (mono-frequency light), the colours disappear. 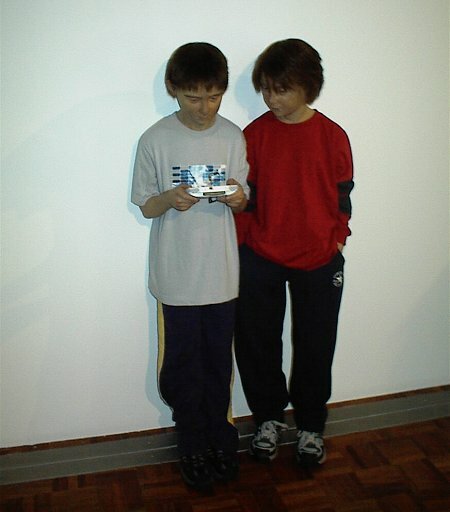 We are astonishingly looking at ourselves and the others (viewers). We ourselves become the art piece in the naked room. We are blind to colours. The complementary colour creates a violet 'post image' in the next room. In the 'camera obscura-room' a hidden camera projects the beautiful 'network' of branches and leaves in the top of the big tree outside the pavilion upon an eye- and circle-shaped table. In the house the windows are substituted by other 'solutions', either a kaleidoscope or a hole in the wall without glass with the view to a green bush being an art piece of nature itself. Olafur Eliasson is inspired by both land-art (Robert Wilson) and by light-art (James Turell). 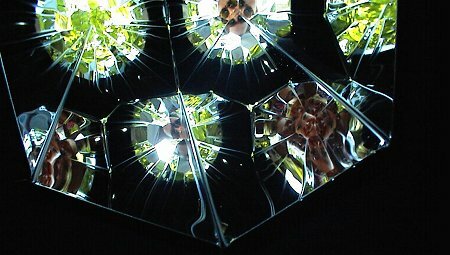 The remarkable use of glass and mirrors constructed in polygon multi-side cylinders (in the space-cave) and in convex and concave positions creates the 'kaleidoscopic and anti-perspective view', meaning many views at/of yourself and the others. The function of the mirror as a creation of identity is a well-known psychological process too. But when the artist operates with many mirrors, it logically reflects the many multi-facetted identities, which people have today - in the multicultural society with displacements of borders in many respects. The view is de-centralized. 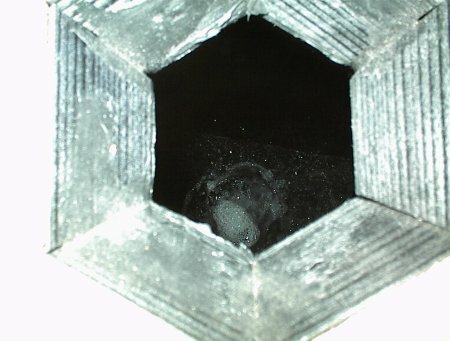 The central perspective is gone. The view is widened both physically and hopefully psychologically too. Paradoxically or logically the title of the exhibition is 'The Blind Pavilion'. The investigation of the view and the seeing is one of the significant intentions in the philosophical art work by Olafur Eliasson. Walking in the labyrinth exhibitions is like losing your way, to walk in blindness and to loose the orientation. (The city Venice quite unintentionally gives this experience too). The intention with this physical provocation of our process of seeing is of course a provocation to open up to new views and perspectives on ourselves and on the world. "By itself labyrinths will arise at the space-station. Olafur Eliasson's exhibition shows us a very self-reflecting and philosophical artist. His fantasy reflects a multi-facetted spirit, and his variable approaches and views of the tradition, the Danish Pavilion in Venice, and the catalogue not being a catalogue, but a 'hybrid' inspire us as viewers. Perhaps our blind spots are going to see. For the exhibition a 'catalogue' being a hybrid and a cross-over between texts and images has been edited. Here are criss-cross lines created of words and here are words creating images. The book itself is a piece of art without beginning and ending and page-numbers - and the spiral back - like the graphic layout where the levels between text and image are unceasingly displaced illustrates a sort of infinity. The text is also a' play', the words are written forwards and backwards and mirrored, and they are placed in a kaleidoscopic layout. And the meanings are of course ambiguous. Paraphrases, quotations and metaphors are woven together in an inter-network with loops and links - referring to digital terminology. With unfolding pages to old family portraits and to beautiful ice crystals and landscapes - perhaps in Iceland, it also becomes an album telling a lot about the different characteristics of the artist, his life and inspirations. The fact that OE in the 'catalogue' also wants to refer to the Venice Biennale -situation is clear, because of the long text about the American writer Henry James, who was present at the very first Venice Biennale in 1895. 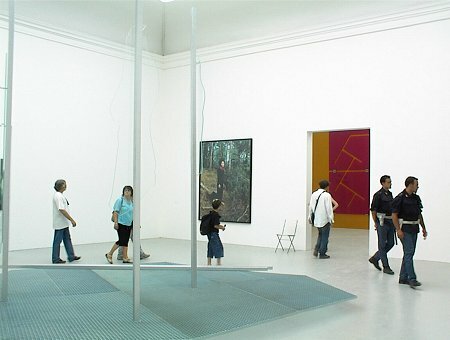 The exhibition and the catalogue are so connected in a Gesamtkunstwerk, into a general effect where concepts like ambiguity, multiplicity and des-orientation are the key words. A quotation about Des-orientation from the 'book' describes appropriately the dominant feeling after the meeting with Olafur Eliasson's art.